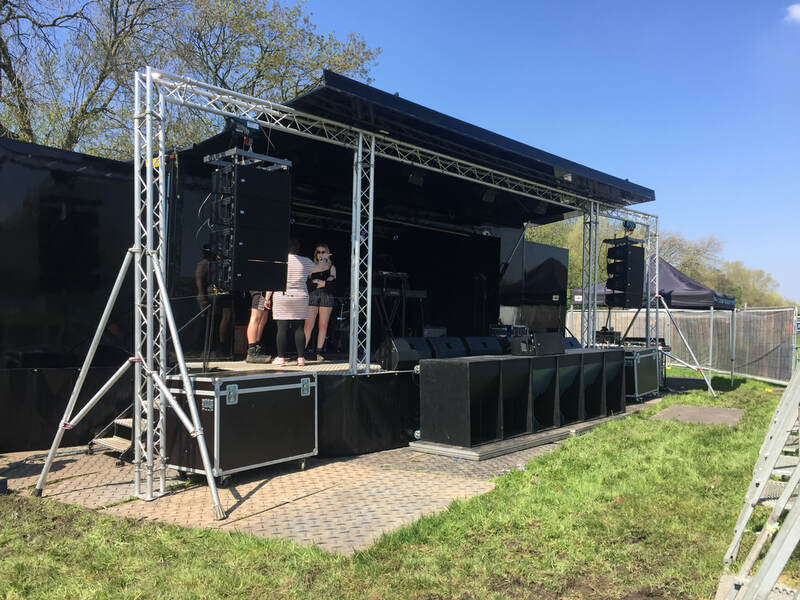 Our most popular stage for hire; offering quicker setup times than any other stage in it's class our custom built hydraulic stage truck is one of a kind: This beast is able to be set up (with a full lighting rig pre-installed) by two people in less than an hour! After an upgrade in 2017 we added the option for extra trussing wings on either side of the stage: Perfect for flying line array speakers or branding with mesh banners. These wings extend the outer frame to be 12m wide. This stage comes with power distribution infrastructure and RCD protection built in as standard: 13amp and 16amp sockets are found around the truck in ideal places for backline and PA use. Just plug a 32amp cable into the inlet at the back of the truck and your good to go! We have pre-fitted a professional lighting package including star cloth back and side drapes into this stage as standard, when power is plugged into the trucks 32amp inlet the lights are automatically powered on along with a miniature DMX controller for quick access to great lighting. We fitted this stage truck with two large rear doors and a tuck under tail lift allowing for both easy wheelchair access and gear loading straight onto side of stage.